For a Truly Extraordinary Wedding Experience, Choose Piper Van W. Frazier! 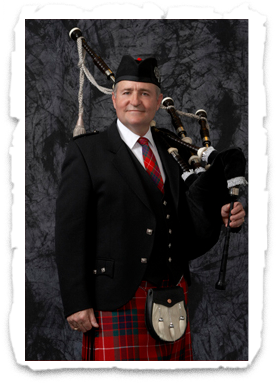 The most requested service for the Wedding Piper is the “Piping In and Piping Out” of the Bride and Groom and the Wedding Party. Often, the Bride and Groom requests a piper to play outside the church before and after the wedding ceremony. Sometimes they also request tunes to be played during the ceremony inside the church, during the processional, recessional, or candle lighting. During outdoor weddings, the piping is often incorporated into the ceremony. Another option is to have the pipes played at a cocktail hour or at a certain point during the reception such as the First Dance or Father and Daughter Dance. The cocktail hour option is especially popular where there is an outdoor garden or patio for the cocktail hour. Van will perform at your wedding wearing scoottish traditional formal, semi-formal or folk highland dress, whatever fits your wedding’s special theme. You may select your tunes from a large variety of stirring music, or trust Van to select the perfect music for you.